I have been looking for so long at all the gorgeous things you have done Shiela but have managed to start knitting again, just finished another cushion cover, Phil bought me a new throw so have been trying to match it up. Thanks so much for posting B. Lovely to hear from you again and lovely to hear that you've been busy with the needles! 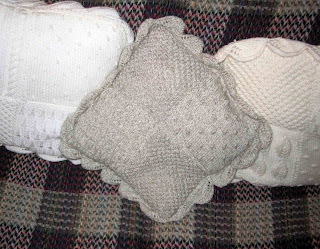 These are really nice - have you used a pattern or improvised? Made several of them before Shiela, my cousin has the needlecraft shop so she copied me the pattern!